Hillcroft’s Residential Services provide support to people with disabilities in a variety of settings. Supports include respite care, 24-hour supported and group living sites and scheduled drop-in services. Hillcroft’s Residential Services provides a well-trained group of professionals who offer children and adults with disabilities assistance and training to increase independent community living skills. 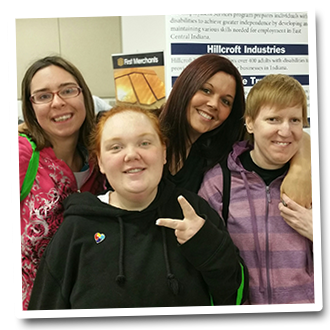 Hillcroft’s Residential Services provides services and supports to over 150 individuals with disabilities in East Central Indiana communities. Support for Hillcroft’s Residential program enables children and adults with disabilities to live as a fully participating member in their community. To learn more about supporting Residential Services, please click here. Hillcroft Services, Inc. has been accredited by CARF for Respite, Supported Living, and Wellness Services. Please click on the logo to learn more about CARF Accreditation. Hillcroft’s Residential Services provide a diverse group of part and full time employment opportunities. To learn more, please click here.